Statoil and co-venturer ExxonMobil have announced the results from their first drill stem test in the Tanzania Block 2 offshore discoveries. The data acquired is important to reduce technical uncertainties in a possible future Tanzania offshore and LNG development. The Zafarani-2 operation tested two separate intervals and flowed at a maximum of 66 million standard cubic feet of gas per day, constrained by equipment, and confirmed good reservoir quality and connectivity. The drill stem test operation was performed through a re-entry in the Zafarani-2 well, in 2,400 metres water depth and approx. 80 kms off the coast of southern Tanzania. The production well rate potentials are estimated to be higher than the equipment constrained rates obtained during the test. The Zafarani-2 operation will be followed by the appraisal well Zafarani-3, which concludes the planned appraisal in the Zafarani reservoir, the cornerstone for a field development in Tanzania Block 2. The Zafarani-2 well test announcement follows the Mronge-1 discovery made in December 2013, which was the fifth discovery in Block 2 and brought the natural gas in place volumes up to 17-20 trillion cubic feet (Tcf)*. The Mronge-1 was preceded by three successful high-impact gas discoveries during the first drilling phase with Tangawizi-1, Zafarani-1 and Lavani-1, and a deeper discovery in a separate reservoir in Lavani-2. Statoil operates the licence on Block 2 on behalf of Tanzania Petroleum Development Corporation (TPDC) and has a 65% working interest, with ExxonMobil Exploration and Production Tanzania holding the remaining 35%. 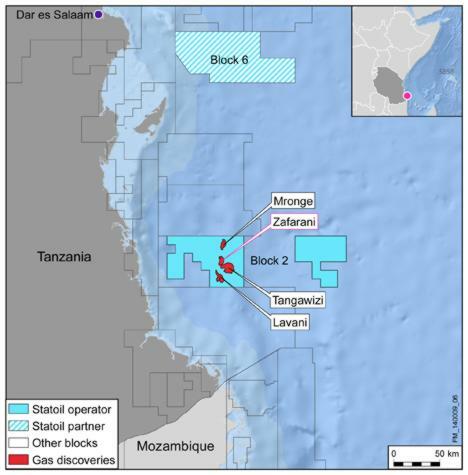 Statoil has been in Tanzania since 2007, when it was awarded the operatorship for Block 2.